I few weeks ago I was dressed down by an analytics friend of mine who is in the business. Based on his employment and housing sales analysis in Alabama (I’ve never been) he suggested my comments about mortgage rates influencing housing prices as anecdotal and hypocritical (who says analysts have to have tact) – that only employment can be correlated. And further…since mortgage rates can not be proved to influence housing sales through multiple regression, any such claims are hearsay and anecdotal. While I agree that housing’s largest influence comes from employment, I was a bit surprised by the out-of-left-field agita I inspired. He was focused on the predictive element of a trend versus a knee jerk reaction to a sudden change in a metric. My comment about a spike in mortgage rates at this moment (not predicting it) as ending the party – is apparently what caused him to lose faith in my analysis. Appreciative of the constructive feedback, I whipped up a couple of US macro price charts. Yes, US employment trends correlate with US housing prices and mortgage rates correlate by showing an inverse trend against housing prices. Predictive? Only if considered with other metrics. July 2009 monthly housing price index report today which showed more of the same – month over month price increases (up 0.3% from June) and year over year decreases (down 4.2%). Since OFHEO (pronounced O-Fay-O), I’ve been wondering how to pronounce FHFA and not be kicked out of Acronym Heaven (aka Washington, DC). Kathleen Hays of Bloomberg Radio interviewed me today on her new show “The Hays Advantage” M-F 1-3pm EST and dubbed FHFA (Foo-FA). That works for me. While it is encouraging news that the bottom isn’t falling out of the housing market, this index basically reflects the low to mid layers of the housing market since it is based on data from Fannie Mae and Freddie Mac, who only handle conforming mortgage products. Currently this means mortgages of $417,000 or less in most of the country and $729,750 in the handful of “high priced” housing markets. That is the market that is recovering first since it has a secondary investor market for bamnks to sell their paper too and ifree up their capital. I find it a bit troublesome that, as we hang on the edge of our seats each month, the revisions for prior releases are all over the map. Last month, the month over month was 0.5% (6% annual) which was revised downward to 0.1% (1.2% annual). Still, the news is better than its been. If you are a believer in trend lines, the following chart suggests we have about 10% more to go until the market reaches the trend broken circa 2001. That means that the sideways motion we are experiencing would have to change for the worse over the next several years. Factors could include more foreclosures, rising mortgage rates, elimination of first time home buyers tax credit, etc. While I am concerned, thats more bad karma than I can process. The ESI, which was first published in April, aims to identify significant turning points in the U.S. economy by analyzing coverage of 15 major daily newspapers in the U.S. The Dow Jones Economic Sentiment Indicator bottomed last November and has continued to edge higher. Newspaper coverage has become more upbeat about the economy (I assume they assume that consumers are sick of reading about bad news), the number of articles expressing either positive or negative sentiment about the economy has fallen now to approaching a third of the level of its peak in October 2008 following the collapse of Lehman Brothers. A lot of people are drinking the Kool-aid right now. I find this particularly ironic since the real estate industry has long blamed “the media” for the making real estate correction worse by “piling on.” However, I find the coverage today to be overly positive from sloppy interpretation of the 4 housing price indices: Case-Shiller Index, NAR Existing Home Sales, Commerce Dept’s New Home Sales and FHFA HPI, showed positive signs. Actually all indices showed less negative results which were discussed excessively positive. Consumers’ assessment of current conditions improved slightly in August. Those claiming business conditions are “bad” decreased to 45.6 percent from 46.5 percent, however, those claiming conditions are “good” decreased to 8.6 percent from 8.9 percent. Consumers’ appraisal of the job market was more favorable this month. Those saying jobs are “hard to get” decreased to 45.1 percent from 48.5 percent, while those claiming jobs are “plentiful” increased to 4.2 percent from 3.7 percent. Confidence among U.S. consumers unexpectedly fell in August for a second consecutive month as concern over jobs and wages grew. The Reuters/University of Michigan preliminary index of consumer sentiment decreased to 63.2, the lowest level since March, from 66 in July. The measure reached a three-decade low of 55.3 in November. I find the whole thing a bit foggy especially using monthly figures for comparison. To figure out how to fix it, you’ve got to understand what’s going on. The Metropolitian Policy Program has launched a series of interactive quarterly reports, the MetroMonitor, a barometer of the health of America’s metropolitan economies, ranking the nation’s 100 largest metro areas—which generate three quarters of U.S. output—on key economic indicators. They look at a number of metrics in the largest 100 US metro areas. 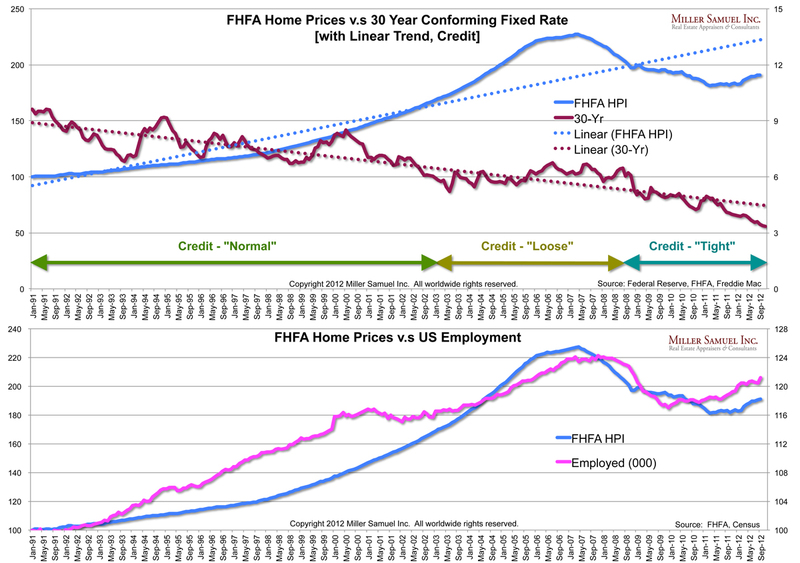 My only criticism is their use of FHFA data which will overstate the recovery of housing since it only covers Fannie and Freddie data, while comprising 80% of current mortgages being issued, is outperforming the remainder. FHFA doesn’t address higher priced housing, often found in metro markets and are usually financed with jumbo mortgages. Only conforming mortgages have been addressed in the stimulus and federal bailouts. The secondary mortgage market for jumbo financing is essentially gone. Regional employment has fallen 2.1%, compared to 2.9% in the US and ranked 34th out of 100 (1 being the strongest). However, wages have fallen 1.5% compared to +1% in US and ranked near the bottom at 97. Deutsche Bank prepared a report on the US housing market that forecasts how much further each market area has to go. The market that seemed to stick out like a sore thumb was New York. This was covered in a Time Magazine story. home prices in metropolitan New York City (which includes Westchester, northern New Jersey and other nearby areas) to fall 40.6% from the prices that prevailed in March. Ironically, that dire forecast is wrapped in an improving forecast for nationwide home prices. This study seems to be another “black box” model where we don’t fully understand the methodology even though it was disclosed in the prior report. Prices would have to drop another 32% from the first quarter of 2009 to return the New York market to levels of affordability not seen since 1998. Deutsche Bank forecasts a total peak-to-trough decline of 52.1%. Rising unemployment and foreclosure activity are offsetting increased affordability. The bottom is considered the historical peak of affordability. In NY’s case, it was 1998. The forecast brings prices to 1990 levels suggesting that the New York City metro area will overshoot the point of peak affordability (1998) by 8.6%. I would think that home prices in Las Vegas and Phoenix can fall 50%+ because there an incredible amount of undeveloped land and limited constrain on supply – highly speculative from the get go. Prices can fall to very low levels in Detroit because the economy is under extreme duress and a declining population. The market area covered was NYC, Long Island, Fairfield and Westchester, Northern NJ and 1 PA county. The 3 big national reports are the data source but FHFA and CSI exclude co-ops and condos, which are a significant portion of NYC housing units and NAR is light on co-op data. Plus the report doesn’t speak to niche differences like conventional and jumbo mortgage financing constraint on the type of properties that will sell. The New York region is NOT done with price corrections. We have a ways to go. Spring market uptick was seasonal and more rebust due to the release of pentup demand after the dearth of activity Dec-March. Every quarter for more than a year, we have seen losses in the neighborhood of $10B – $20B for each of the former GSEs Fannie and Freddie. However, with the Stim and bailouts in the multi-trillion range, the current losses seem like chicken feed (no offense meant to hard working chickens). FHFA, the federal oversight agency that was created after the meltdown began (don’t get excited, it is essentially the former OFHEO and appears to be run per the same executives that were in charge of oversight before the meltdown) reported that both Fannie and Freddie are facing “critical” problems. Ok, this is nothing new. We know these agencies will be losing money for many years until we undergo extensive de-leveraging. What continues to be a concern for me is the ability of these agencies to attract talented people to steer them. Even though the GSEs are essentially federal agencies, they are dealing with enormous and complex problems. Their predecessors were highly compensated but, like everyone else, didn’t see it coming. Images of the government issued gray painted rooms and bulky metal desks come to mind – ie, your local DMV. One could argue that the “talented” executives were the ones that got us in trouble. However, I think this is an over simplification and short sighted. That’s why salary caps in most company situations are probably short-sighted. Ben & Jerry’s took several years to find a CFO because of their 5x salary cap from lowest to highest paid employees kept away good talent. Yes some Wall Streeters got crazy compensation packages, but do we get even with them and apply it to all executives connected with this financial morass that take Fed dollars or work in Fed agencies? Is this a case where the exception makes the rule? How will “toxic mortgages” be sold off if the company purchasing them feels even a hint of salary cap talk, even retroactive salary caps? Senior executives are not likely to jump in the pool, if their bathing suit might be taken away without warning – ok, bad visual but hopefully you get my point. Although when I renewed my driver’s license last year, it only took 10 minutes.